This story is basically about friendship, as in how small discoveries can foster up the friendship overall. The narrator of the story is a young school-going boy, probably an early teen. One day while coming back home from somewhere, he hears the gurgling of water at some distance. 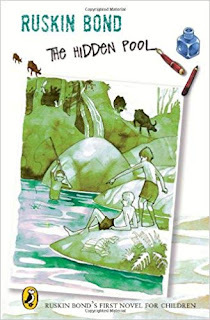 He then goes inside the dense forest and finds that there runs a small stream through the rocks and beneath lies a pool – not so big, but fine for the young boy. He goes running and calls his other friends Anil and Kamal. They named it as Laurie’s Pool. They keep it hidden from other boys and these three boys often meet there for fun. They sometimes come there after the school. In the line of their adventure, they begin with fishing first and then wrestle in the water, and sometimes ride on the back of buffaloes. Among all activities, fishing is the prime one. They try to catch fish by net, rod, or clothes, but to no avail. One day Anil brings gunpowder and have it blasted at one rocky side, as a result rocks get exploded and they were able to catch fish in plenty. Next, they build a dam on one side to make the pool deeper. However, with torrential rain it all washes away, even their clothes get washed away. At night, they roam around the city fully naked and secretly creep inside their respective homes. So, the story is full of these kinds of anecdotes. It’s good to have a rendezvous for friends – a sign of great friendship. Not only this, the boys are so charmed by this hidden pool that they started visiting it during full moon night, without caring about wild forest and animals. If you know how to make peace with nature, there is always a way to enjoy it. According to the narration, as in mentioning of mountains, hills, forest, wild flowers – it is clear that the story is staged against the foothill of the Himalaya – Ruskin Bond’s favourite backdrop. Lovely story with simplicity at its zenith.